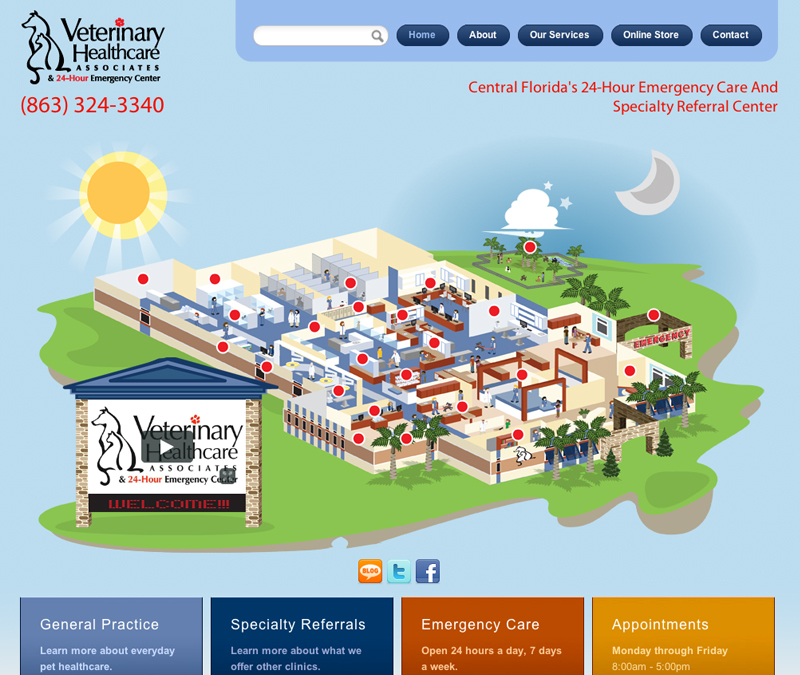 Veterinary Healthcare Associates is a large scale animal hospital in Winterhaven, Florida taking in referrals from all over Central Florida. They contacted us in need of a site that reflects their high-tech facility and gives veterinarians and patients alike a close look into what happens at VHA in a fun and interactive way. VHA’s prize possession is their brand new state-of-the-art facility so we illustrated a very accurate map of their whole building including their members-only dog park. Users can use their mouse to rollover the red dots and find out what happens in each room. VHA’s second prize possession is their doctors, so we made each doctor stand out on their own page complete with a brief video so users can get to know their doctors before making an appointment. Other features of the site includes Facebook gallery integration as well as other social media feeds and Hellow Yellow’s SmartyVet feed.